People gather to see one of the many attractions at the Confederation Centre Art Gallery in Prince Edward Island, Canada. The Confederation Centre Art Gallery in Prince Edward Island, Canada displays over 15,000 amazing pieces of Canadian artwork. Musical theaters, comedies and art shows are some of the fabulous performances put on at the Confederation Centre Art Gallery. 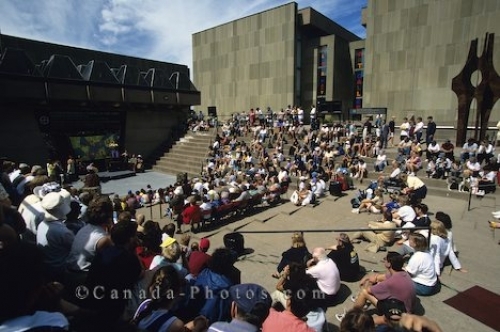 Picture of a crowd at the Confederation Centre Art Gallery in Prince Edward Island, Canada.